Celebrate with a Magical vacation! Enjoy a fantastic stay in our luxury vacation home- all at an affordable price! Our home is conveniently located to area shopping, restaurants, markets and theme parks - 5 minutes to Disney. Please read our guest reviews to hear what former guests have to say about their vacation! Minutes from Walt Disney World and many other famous area attractions, our luxurious and spacious 5 bedroom, 4 bathroom home has the perfect layout to accommodate your family and friends without sacrificing personal space!! We strive to make our guests feel at home with exceptional customer service and quality accommodations. We offer two master bedrooms each with king beds and private bathrooms and private entrance/exit to the pool and lanai area. We have three other distinctively decorated bedrooms with adjacent bathrooms - two of which are themed - a Mickey Mouse and friends themed bedroom with adjacent Mickey themed bathroom and a Princess themed bedroom which shares the Mickey bathroom as well! For the times you feel like cooking, our full size kitchen and eat in area can accommodate your family with ease. We also have a separate dining area that can seat up to 6 more people as well. For the times you want to relax at home, our private pool (heat is optional) and Jacuzzi spa is the perfect solution. There are 3 entrance/ exits to the pool/lanai area, each with a safety alarm to each door. There is also a separate gaming/computer room where we offer xbox gaming system. We also offer a full service computer with FREE WIFI access. 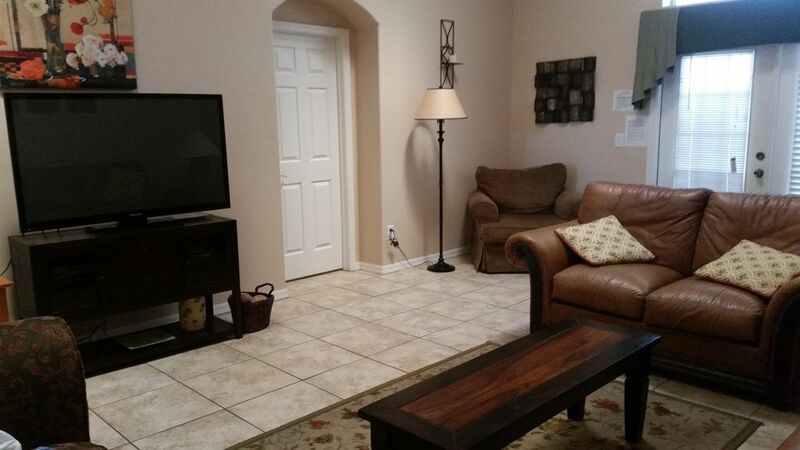 Our over-sized family room is complimented by three sofas and wide screen HDTV for your entertainment enjoyment. When you vacation at our home, you can enjoy FREE LONG DISTANCE phone calls (within the U.S.) and FREE WIFI. Our home is the perfect setting to make any vacation relaxing and enjoyable - we have enough rooms and space for your entire family and then some! Stays of less than 5 nights have the cleaning fee added to the nightly rental. Pool and spa heat are optional features. The security deposit can either be a pre-paid refundable $350 which is returned so long as no damage is done to the house - or a non-refundable $59 protection plan. WE HAVE A MANAGEMENT COMPANY MAINTAINING OUR PROPERTY YEAR ROUND TO ENSURE THE PROPER MAINTENANCE AND UP-KEEP OF OUR PROPERTY AND TO RESPOND TO ANY UNEXPECTED EMERGENCIES. We hope you enjoy your stay at our Disney home as much as we do - my family visits Disney World quite often and just loves everything about the area and parks!! There is so much to do at the house and in Kissimmee and Disney! Enjoy! Our home is located in Indian Creek - a wonderful development that feels like home. Our home is conveniently located to everything -shopping, dining, food markets, attractions - all within a few minutes drive - and with the shortcut to Disney - we can be at Animal Kingdom within 5 minutes!! We think it is the best! Our family loves to use the pool - no matter how hot or cold it happens to be outside - there always manages to be time for a dip in the pool and hot tub! The layout of our home is also great in that the common areas provide a great opportunity for families to catch up on the day and yet, there is enough space within the home that everyone has a place to go by themselves when that alone time is needed!! Great for family trips that include extended families! We also love having the computer at the house - the kids love logging on to their favorite sites. Great house. We had a wonderful time. Thank you! So glad you enjoyed your stay!! Thank you for your review and so glad you enjoyed your stay in our home! We loved staying here. We had plenty of room, and the house was very clean! We had easy access to the parks, and my kids loved coming back to go in the pool. Thank you for sharing your home with us. Nice home but there were many things that could be done by the owner to make it an excellent stay. The house is well laid out & works well for the 8 adults & 2 teenagers that we had. The location was great as far as access to the parks. But the house was at the end of a street that was blocked off by a big fence, disrupting the aesthetics. We had a great week & enjoyed our vacation. The homeowners were very responsive to our phone calls & fixed the major issues as soon as they could. 1) The home was listed as having three master bedrooms with the front bedroom having a bathroom inside of it (per a floor plan that was sent to us). However, the bathroom was out in the hallway. The front bedroom only had a trundle bed and a closet. 2) The rooms were quite small and hard to move around in. In addition, although each room had a TV, most of the TVs were very old and it would've been better to have the counter space than the bulky TVs. 3) There was a random room created from the garage that we weren't sure what it was for. It was not air conditioned, so we just left the door to the room closed all week. 4) We were unaware of the alarm system on the doors leading to the pools (there are 3) & they were quite a nuisance during the week - especially coming in from the pool as you couldn't turn off the alarm before it went off. The disrupted the relaxing atmosphere. It would've been helpful to have a notice on the door with directions (basic directions & the alarm were behind a curtain). There are other options available that do not require an alarm system. We suggest that the homeowner look into them. 5) The filter on the pool was broken when we arrived & the hot tub was unusable for a few days as they called in maintenance & a specialty pool company. This should have been checked BEFORE we arrived. 8) The house is very dim at night - consider adding more lights or higher wattage bulbs would help. I am truly glad you enjoyed your stay in our home and had a wonderful vacation. I must respond however to the inaccuracies in your review and viewpoint. First, we chose our home BECAUSE it was the last home on a dead end street- it provides extra privacy and parking and the fact that we have no neighbors to the left or across (house faces a different street) from us was an added bonus. The only issues I was made aware of during your stay was the pool circulation and alarm - both were addressed promptly. 1) The pool and home was inspected a day before arrival and no problems were detected. As any homeowner or renter knows, things happen unexpectedly despite all precautionary efforts. In this case, the pool pump stopped working. The guest contacted me and I immediately handled the problem. 2)My home has NEVER been advertised as having 3 master bedrooms as we only have 2. If you found my website that has the floor plan, it clearly states a disclaimer that the front bedroom does not have an attached bathroom. Further, the pictures also show the trundle set-up of 2 twin beds. 3) Pool alarm - we are required by local law to have all exit/entry doors from the pool area to be alarmed and this was explained to the guest. 4) There are plenty of towels in the home. There is limited bathroom storage, so we use the extra closet in one of the master bedrooms to hold the towels. We have never had an issue before of guests not finding the towels. We also have extra blankets in every bedroom and pillows too. 5) We have a monthly preventative pest control plan as proactive steps against Florida's unwanted pests. 6) We converted our garage into a bonus room for computer use, gaming or play. We were in town for a cheerleading competition. We had 2 families staying in the home. We loved the 4 bathrooms and the space in the home. It wasn't crowded at all. We slept very well on the bed. We would definitely rent here again! Thank you Jodi! Thanks Deanna! Glad you enjoyed your stay and felt right at home! The rooms were great. We were close to the Orlando attractions. The only problem was that the key code was changed at 9 am instead of 10 am on the day we left. Our home is conveniently located to everything - we are 5-10 minutes to Disney property and all the great things Disney has to offer. About 25 minutes to Sea World and Universal Studios. We are about 10 minutes to I4 which can get you to the east or west coast of Florida. We are about an 1 hour to local beaches - both the east and gulf coast side to Florida. We have so many great restaurants and shopping within minutes of our home. There are 2 great outlet centers about 20 and 25 min from the house. Local attractions and relaxation are all around us - you will never be bored! Rates are subject to change. Stays of less than 7 nights incur a cleaning fee in addition to the nightly rental. For stays of 7 nights or more, the cleaning fee will be removed from the quote. Payments can be made via check or credit card or paypal. Payments by credit card and paypal will incur a 3.5% surcharge. CANCELLATIONS of reservations - more than 8 weeks you will receive a full deposit, less $50 cancellation fee. Between 4-8 weeks, you will lose 50% of deposit and $50 cancellation fee. If you are less than 4 weeks, you will lose entire amount paid.